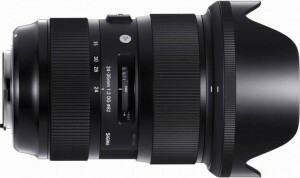 At the end of July 2015 the eagerly awaited Sigma 24-35mm F/2 DG HSM Art Lens will be released. This lens will be offered for Nikon, Canon and Sigma lens mounts and is compatible with Sigma’s mount swapping service. What has photographers chomping to get their hands on this lens it will be the first constant aperture f/2.0 zoom lens designed for the DSLR full frame cameras, meaning in plain English you will get three prime lenses in one with this unique innovation. There is no need to swap lenses with the Sigma 23-35mm F/2 as you will have a 24mm, 28mm and 35mm all in one lens. Those who have been lucky enough to give it a trial run report it is solidly built with excellent sharpness all in one single zoom lens. Sigma has been knocking it out of the park with their Global Vision Art-series lenses and the Sigma 24-35 F/2 is definitely a home run. This lens produces crisp images and at F/2.0 the only reported issue is a little softening around the edges that clears up as you stop down with a sweet spot sitting at F/4.0 to 5.6 providing ultra-crisp images. There is very little chromatic aberration and only minor fringing can be seen in the outside corner of the frame. The Sigma 24-35mm F/2 has some vignetting in full frame at f/2.0 but tapers off as you stop down. Barrel distortion was detected which wasn’t surprising considering the wide-angle lens but it is well controlled throughout the focal length with the distortion most noticeable at 24mm focal length. The distortion is well under the 1% average and improves with the longer focal lengths to almost zero barrel distortion. Physically the Sigma 24-35mm F/2 DG is well built with Sigma’s Thermally Stable Composite material, matte black finish and well gripped focus and zoom rings. This lens is quite hefty because of being so solidly built weighing out at slightly over two pounds. This makes the lens heavy on the camera with 18 lenses in 13 groups with 9-bladed circular aperture diaphragm, a single flurite like glass element , seven SLD elements and at least one aspherical lens but it is a shorter lens so it isn’t overly awkward or unbalanced. Sigma continued with their Hyper Sonic Motor drive in the 24-35mm F/2 providing the quick and quiet autofocus. The AF motor is virtually silent and you can feel it more than hear it working. Naturally there is the standard manual focusing with distance scale and an AF/MF switch right on the barrel and 90 degrees of rotation on the manual focus ring. The early reviews are good for the Sigma 24-35mm F/2 DG SHM Art Lens. Those lucky enough to have tested this full-frame three in one lens are excited about the build quality but also the outstanding performance with only slight barrel distortion, vignetting and limited chromatic aberration that most people wouldn’t notice but in testing it was pixel scoped. It will be a big hit when it hits the stores at the end of the month. Set your price on the Sigma 24-35mm F/2 DG HSM ART Lens with Greentoe here.